How do I place a project with SketchDeck? Placing a project is easy! Just head over to the product Shelf and choose the project type from the shelf that is the best fit. Fill out the brief. At the bottom of the page, you’ll be given a live project price and estimated timeline. If things look good, just press “place project”, and we’ll get to work. Learn more about how to use SketchDeck on our New user guide. The best way to get a quote for your project is to start a new order. You’ll get a live quote for your project before you submit it. Prices are calculated based off of the type of project, the size of the project, how fast you need it, and which level of design you desire. Visit our our work page to look through previous projects we've worked on. If you're interested in seeing more examples of a particular type of project, email us at success@sketchdeck.com. Why are there additional charges to my account? Your initial project price includes several iterations of the design at each step of the process. Every project is slightly different in scope, so if you'd like to know exactly how many iterations your project includes, send us an email at success@sketchdeck.com. When projects run into extra iterations, we charge a project "on the meter" at our standard hourly design rate of $75. How do I add notes/comments/feedback on my project for the designers? 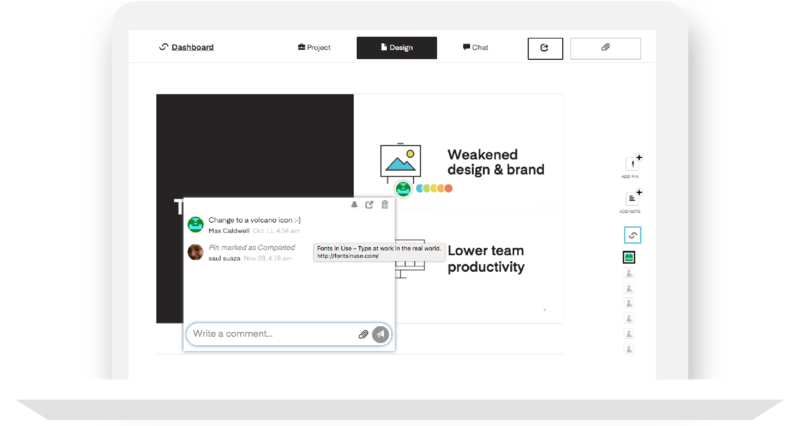 Once your project is ready for you to review, you can add comments for the design team using Jot. Click near where you’d like a change made and a sticky note will open where you can type or add files. Add as many as you’d like, but when you’re done, remember to submit your feedback by clicking “Send feedback to team”! How do I send files/pictures to the design team to add into my project? 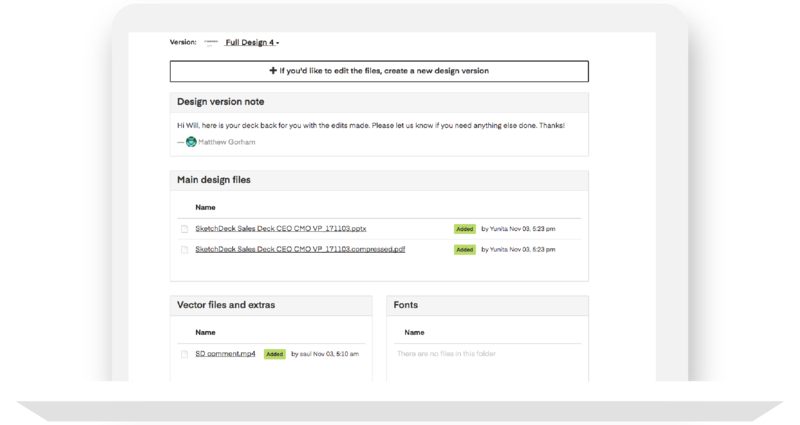 You can add files or send comments to the design team by using Jot. 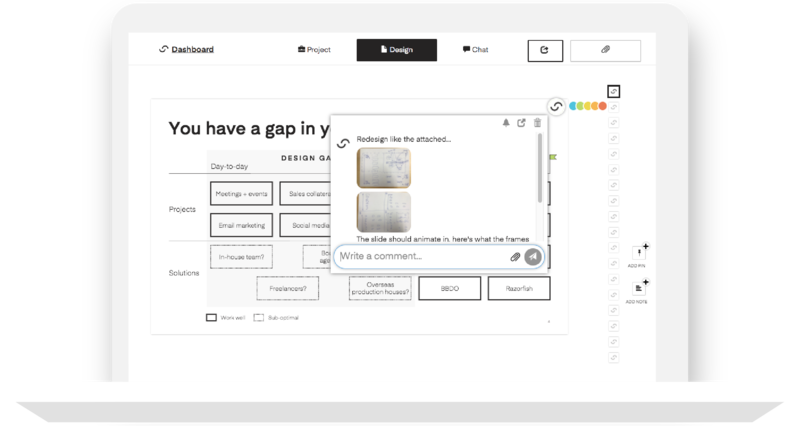 Once your project has an update, click on it wherever you want to leave feedback. A sticky note will open and you can enter text or attach files and photos. If you have an updated draft project that you’d like our team to work on from now on, you can attach this to your “brief” – just remember to save it! You can view and download all of the files associated with your project by opening the “Download” section in your project. This includes the deliverables you requested in the project brief, a PDF proof of the project, and any custom fonts we might have used. If you want to display the presentation on computers that don't have the fonts installed, you have a few options: Export the presentation as a PDF and view that (it will display perfectly on any device). If you're using PowerPoint on Windows you can embed the fonts. Finally, you can simply install the fonts on the target computer. When will I get my next iteration? Our team is always working hard to get your project back to you in time! 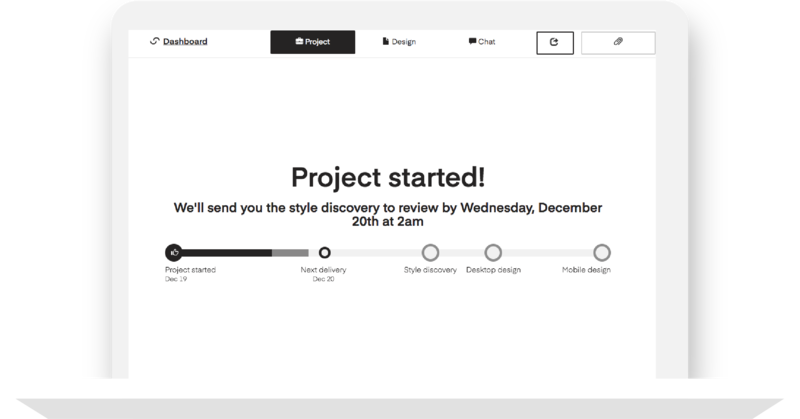 You can see your estimated delivery time on the main screen of your project. If for some reason it hasn't been delivered as scheduled, reach out to us at success@sketchdeck.com or send us a message in your project's chatroom and we will see what the hold-up might be. Most often if this is the case, a last minute change has been requested and the design team needed a little extra time to complete your work. How is my work kept confidential? We respect your company’s privacy and always treat your work with confidentiality. All of our designers have signed privacy agreements, and your information will be kept between you and us. Our tech securely logs you into your account to view your project each time, so only you and the colleagues you invite to your project have access. We work with companies of all sizes and each one is treated in the same way. If you prefer to sign an NDA with us, we're happy to accommodate.